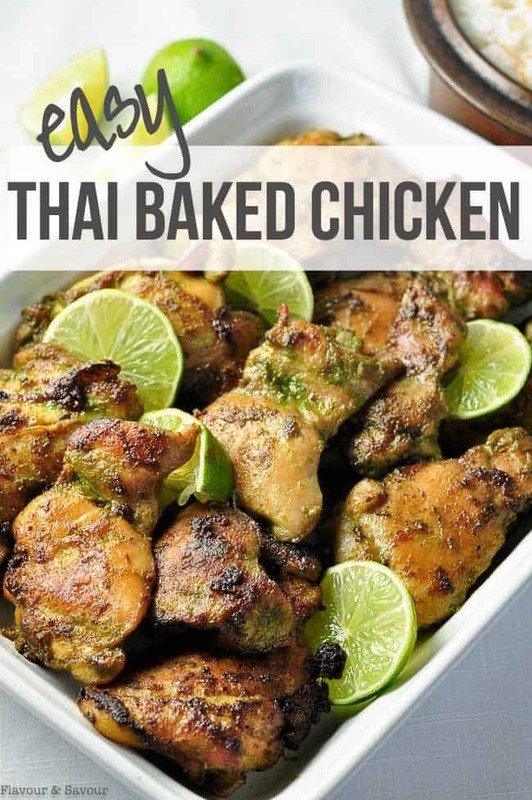 This Easy Thai Baked Chicken is a simple make-ahead meal to pop in the freezer for a busy day. It’s a slightly spicy Thai chicken recipe that leaves you wanting more! Paleo-friendly. Don’t you just love the complex tastes of Thai food? Thai recipes usually contain ingredients that are sour, sweet, salty, bitter and spicy. 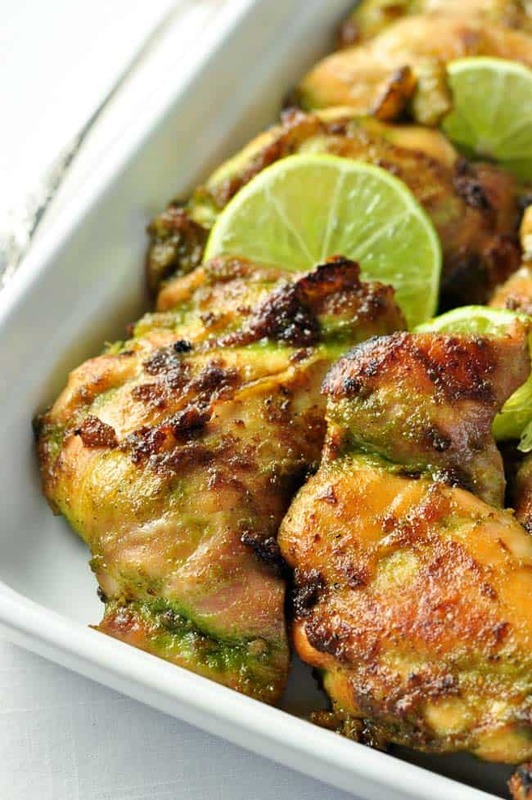 The marinade for this easy Thai Baked Chicken blends and balances those flavours harmoniously. 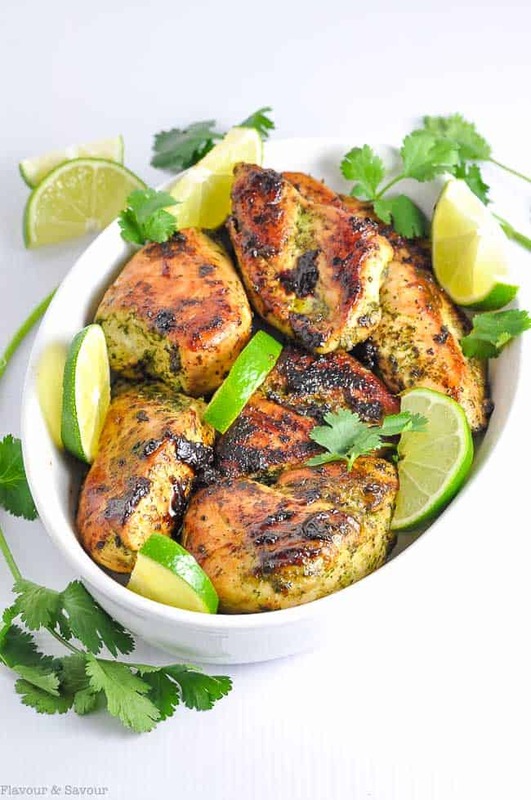 Cilantro, jalapeño, ginger, basil, garlic and coriander all play together to produce this aromatic, slightly spicy chicken dish that leaves you wanting more. 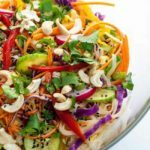 As much I love Thai dishes, I also love easy meals. Especially ones that I can make ahead and have in the freezer, ready to grab for a quick dinner on a busy day. This recipe also makes a great meal to take camping as it can easily be grilled instead of baked. It’s suitable for those on a paleo diet, too! Make the marinade and put it in a plastic zip closure bag with the chicken. Refrigerate for 2 hours (or up to 24 hours) before baking. If you’re not planning to use it right away, lay it flat, freeze, and it will be ready for another day or to pack for a camping trip. Make some Thai Coconut Rice (which also freezes well) to go with it. Then all you’ll have to do is prepare a salad and veggies. 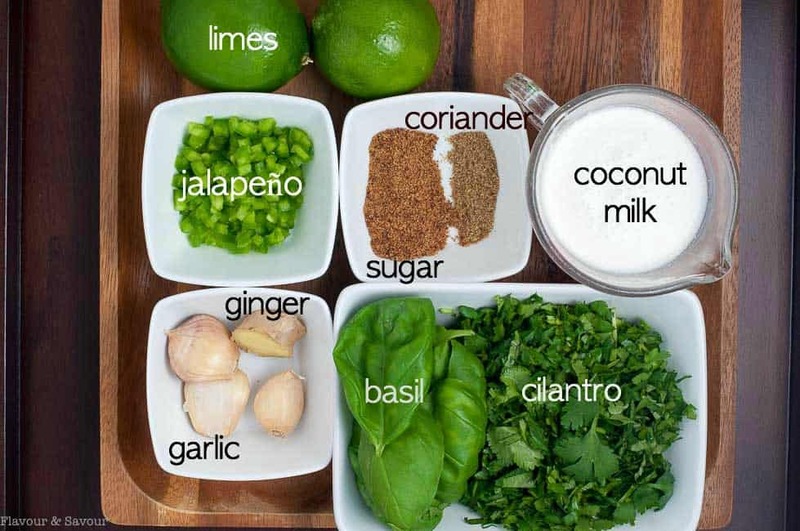 Blend all marinade ingredients in your blender or food processor. Pour the marinade into a zipper closure bag with the chicken. Let it marinate. This chicken dish has consistently been one of the most popular recipes here on the blog. 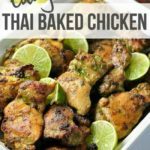 If you make this Easy Thai Baked Chicken recipe, I’d love to hear your thoughts! Let me know in the comments section below, or snap a pic and post it on Instagram! Tag me @flavourandsavour . I love seeing what you make! 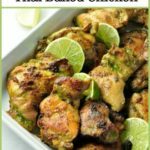 Full of the complex flavours of Thailand, this Easy Thai Baked Chicken is a make-ahead dish that freezes well too. 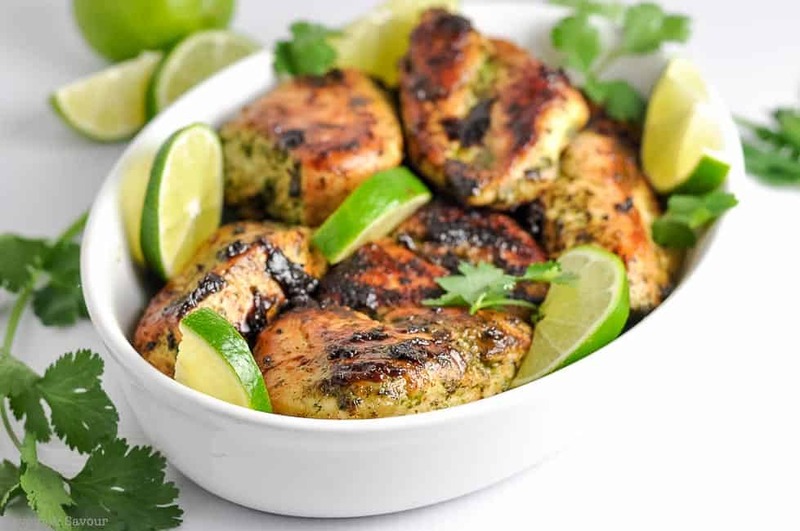 Cilantro, jalapeño, ginger, basil, garlic and coriander all play together to produce this aromatic, slightly spicy chicken dish that leaves you wanting more. Add marinade ingredients to food processor and purée until smooth. Arrange chicken parts in a single layer in a large freezer bag. Pour marinade over chicken, seal tightly or vacuum seal and massage the marinade into the chicken a bit. Cover and refrigerate for at least 2 hours and up to 24 hours, or simply lay it flat in the freezer and freeze for another day. When ready to cook, thaw completely. The safest way to thaw is in the refrigerator overnight. To bake: Preheat oven to 375F. Heat a large oven-proof skillet over medium to high heat. Add oil and wait until it ripples or shimmers. Add chicken pieces and sear on each side for 3-4 minutes, then place skillet in oven for 15 - 20 minutes or until it has reached an internal temperature of 165 degrees. Cover with foil and let stand on a platter for 5-10 minutes before serving. If you want to grill it instead: Place chicken on medium-hot well-oiled grill. Turn when chicken has grill marks (approx. 5-6 min). Cook until internal temperature is 165 degrees at the thickest part (about 7-8 minutes). 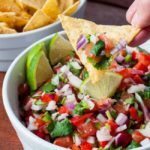 Sprinkle with more chopped cilantro and serve with lime wedges. Oh, I’m so glad you liked it. We love it too and I make it often. Thanks so much for your feedback. Comments like yours make my day! 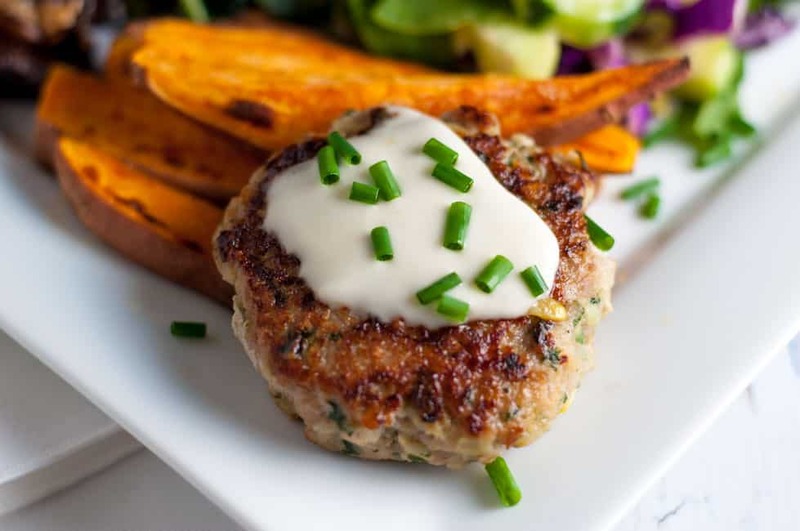 Hi Elaine: I made this recipe last night and my family gobbled it up! It’s so easy and absolutely delicious. This is definitely a keeper. 🙂 Thanks so much for sharing your recipe. That’s so great that your family loved it. I love how easy it is too! I really appreciate you letting me know. Happy cooking! I made this last night with only a couple substitutions. I added Turmeric and I didn;t have fresh cilantro so I used Coriander Chutney! I also added fresh lime and lemon juice. So gooood! Thanks for a new fave recipe. Karma, I love your substitutions! Coriander Chutney is something I must try! 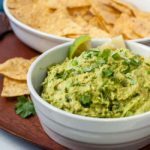 Not the best question, but could I substitute parsley or another herb for cilantro? I’m a cilantro hater, but would love to try this recipe without losing too much flavour. I know there are lots of people who really have an aversion to cilantro. I don’t think it would be a problem at all to leave it out as there will still be so much flavour from the other ingredients like garlic, ginger and lime. Try it! Thanks for your idea! No cilantro and still so tasty! I bought very thin breast filets by mistake, so I actually rolled them and cooked in the oven the whole time. They were great. But I’ll try searing next time! What a creative solution, Leslie! I’m glad the adaptations you made worked so well for you. I love hearing how others change and adapt my recipes. Happy cooking! This sounds amazing! What do you suggest serving this with? I usually serve this with my Thai Coconut Rice and stir-fried vegetables or fresh salads made with whatever is in season at the time. 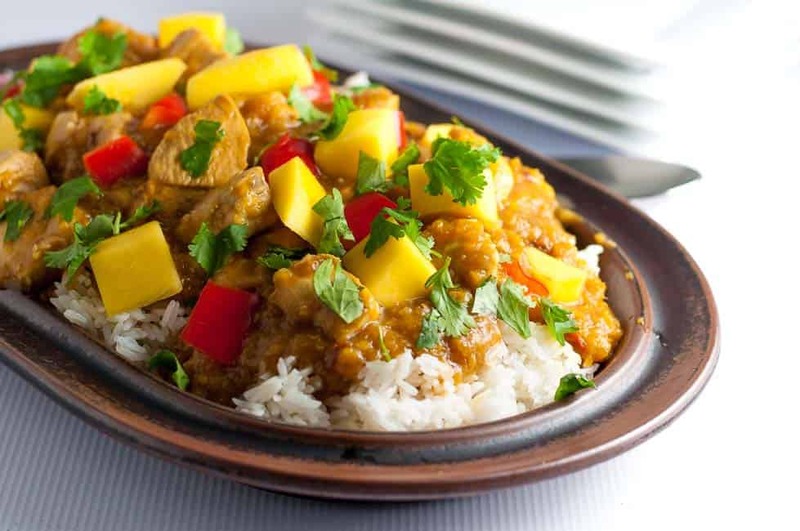 We really love this dish! I hope you do too. This was so flavorful and tender, I couldn’t believe it! I knew the recipe would be too much for just my husband and I, so I split it into two freezer bags to be used on those days after work where I’m feeling too tired for a complicated meal. This was so easy! I just made one bag tonight and it is now my favorite chicken recipe. Thank you for posting this! Thanks Rosalyn! We love this chicken dish too. It’s definitely one of our favourites. And there is no better feeling than coming home tired and remembering you have something delicious in the freezer! Thanks for your comment. I saw this recipe and I desire to make it. The only problem is that I have skin-on and bone-in chicken thighs. Do you think this recipe would work at 400 degrees for 40 minutes? Or would the milk scorch? Have you tried substituting? Hi Celeste. Skin-on, bone-in chicken thighs work well with this recipe. After you sear them on the stove top, bake them at 375 degrees. They will take 30 – 40 minutes depending on their size. Enjoy! Thanks for your question, as it helps my other readers, too! What kind of canned coconut milk did you use? Low fat or regular? Thanks! I use the full-fat coconut milk. It should be fine with the low-fat coconut milk, but I’ve never tried it myself. I hope you like this recipe as much as we do! Thanks for your question. I’ve made this 3 times, soo good!..Froze the last batch, excellent.!!! The only problem with this recipe is the temptation to make it too often. It is so easy and really delicious. I serve it with coconut rice and a green veggie on the side. Love it! That made me laugh–but it’s so true! Thanks for commenting! Wonderful, easy recipe. We thoroughly enjoyed this flavorful dish. We will definitely make again! It’s a favourite of ours too. So easy! I often make a double batch and freeze half of it with the sauce. Thanks for commenting! Just curious to see what kind of basil did you use? I have regular sweet basil and I have Thai basil as well. Does it matter? I used regular sweet basil, but I’m sure Thai basil would be fine as well. Thanks for your kind words! Do you use the marinade or throw it out? I know this is probably a dumb question but had to ask. There are no dumb questions! There are probably many people who would like to ask the same one! No, I don’t re-use the marinade, as it has been in contact with raw chicken. Thanks for stopping by! I would use the marinade to cook rice or veggies in. I was wondering if you spoon on some of the marinade during the baking process? This is ok, since any bacteria will be killed in the oven. 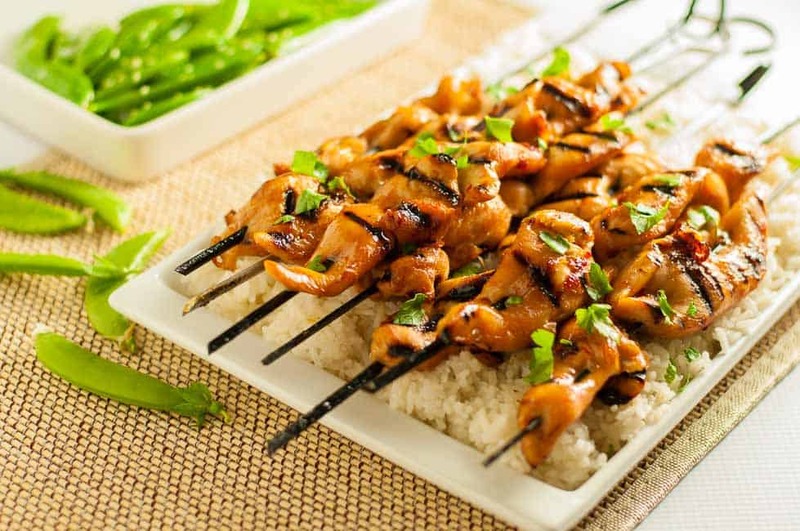 I find the marinade for this is quite thick and most of it sticks to the chicken, but if you have some left in the bag, I think it would be fine to baste the chicken with it as soon as it goes in the oven, so, as you said, any possible bacteria would be killed. Hope you love it as much as we do! Here’s a coincidence: I just took a bag of it out of my freezer to pack up for our camping trip a few minutes ago, then saw your comment. Thanks for your question! Since I do not have an oven safe skillet, Is it possible to skip the searing on the skillet and just use a normal baking pan to bake the chicken? If so, how long do you suggest I leave the chicken in the oven for and what temperature should I use? Yes, you can skip the searing and bake them in the oven. Boneless thighs cook quickly. Heat your oven to 375°F. and bake for about 20 minutes. Check with a meat thermometer to make sure the chicken has an internal temperature of 165°F. Enjoy! I know this is an old post but I wanted to share what I did. 🙂 First I made this the way it’s written and the marinade is SO FRIGGIN’ GOOD that I knew I had to find other ways to use it. I made the marinade into a sauce, added ground turkey and put the whole thing over zoodles. OMG. So good and another way to use this amazing recipe! 🙂 Thank you! Oh Yum! That’s a fabulous idea! Thanks so much for sharing it with us all! Such a healthy meal and I’ll bet it tastes incredible. Must try!! I know this is an old question, but I’ve made this recipe several times. A few times I forgot the sugar. The recipe was still delicious and I honestly couldn’t tell the difference. Thanks for the tip, Chloe! I am wondering this too. Did you try leaving the sugar out? Hello, just a question about the nutrition. Your recipe includes a calorie count of 248 calories is that per chicken breast? The calorie count is for one chicken thigh. While you can use breasts, I calculated it on boneless, skinless thighs, as that is what is in the photo. I’m meat free so I switched the chicken for cauliflower and it was amazing !! I want to put this marinade on everything ! That’s a brilliant idea, Sydney! I’m going to try that. Thanks so much for sharing!! Your instructions say, “Heat a large oven-proof skillet over medium to high heat. Add oil and wait until it ripples” but I don’t see oil listed among the ingredients. Should there be a specific amount of oil or simply oil to cover the bottom of the skillet? Thanks! I add just enough to make a very thin layer on the bottom of the skillet. Depending on the size of skillet you’re using, it’s usually about 1 tablespoon. Thanks for your question! I don’t know what I did wrong, but this dish was just as bland as could be – so disappointed. I followed the recipe exactly, no subs. The marinade tasted great (before I added the chicken of course) so I was expectant that it would be great. However, when it cooked there were no delicious aromas wafting around and the chicken thighs had no marinade flavor at all. I’m just stumped. Only thing I can think of, is perhaps the 4 hour marinade time that I used was not enough. Yet other people have said that was enough time – makes me wonder if folks know what good food should taste like. Could an addition of a soy sauce or a vinegar might penetrate the meat better? How disappointing for you, especially when you read how much others have liked this recipe. 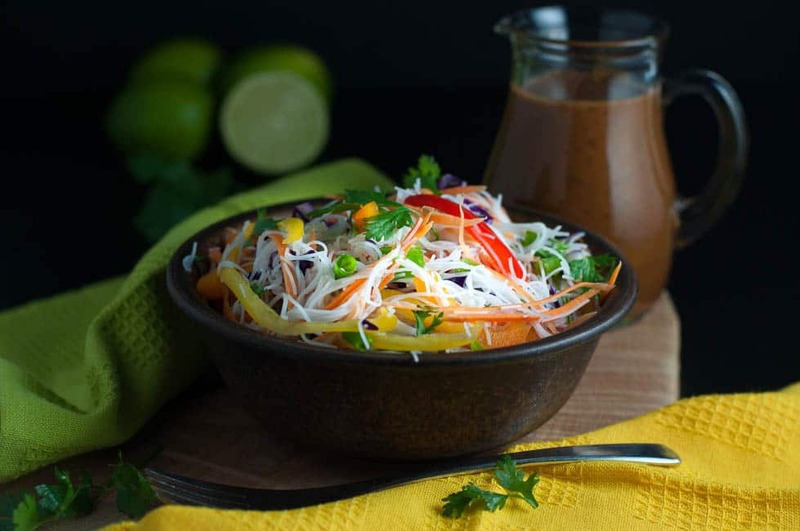 The Thai flavours in this recipe are more delicate than some–lemongrass, coconut milk, cilantro and hints of ginger and jalapeño. I described this dish in the post as being “slightly spicy.” I’m so sorry it didn’t meet your expectations. I want to try this in the next few days and was reading the comments. I see in this comment you refer to lemongrass but I don’t see lemongrass as an ingredient? Should we be adding lemongrass to the marinade? Thanks! Thanks for your question about adding lemongrass, and thanks for your patience when I mess up!! I must have been thinking about another Thai recipe when I replied to that comment. No, there is no lemongrass in this recipe. Hope you like it as much as we do! I don’t have an oven safe skillet is it fine to fry for a few minutes and then put the chicken onto a baking dish into the oven? The cilantro overpowered every other flavor. I only used 3 chicken thighs and 4 wing pieces. It was sooooooo green. I think that it needed more time to sear. not sure if I will try it with the cilantro again. Oh–that’s disappointing for you. 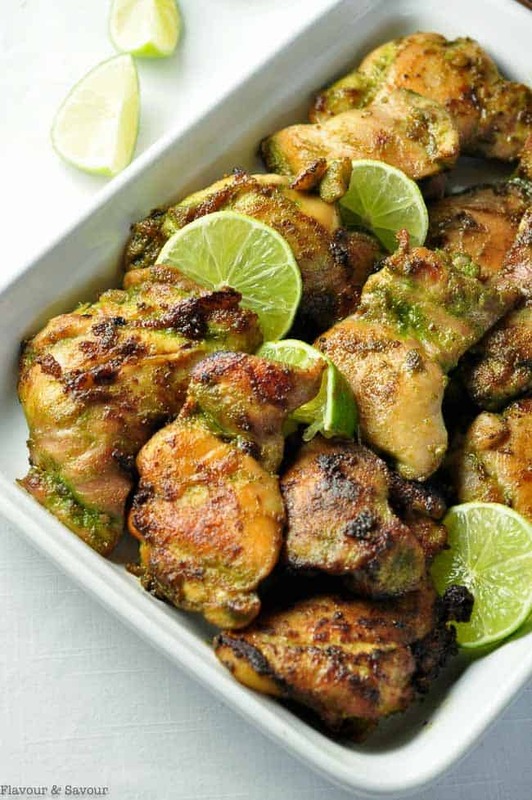 Do you think you may have had too much marinade for the amount of chicken you used? I agree with your ideas–when you make it again, give it a little more time to sear and brown, and you can certainly reduce the amount of cilantro to your liking. Thanks for commenting. This chicken was delicious! It has so much flavor, the two people who didn’t like this either have terrible taste in food or messed up a totally easy recipe, I can’t wait to make this again, I served it with cauliflower rice and salad. Thanks so much, Crissy! I just made this again yesterday. 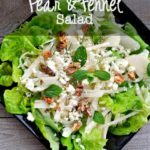 That’s a great idea to serve it with cauliflower rice and salad. Fill your plate with veggies, right? Thanks for sharing! I suspect you could easily substitute cream successfully, or even almond milk. Let me know if you do try it, as I’m sure other readers would like to know, too! Do you have any advice in making this a crockpot dish? Thanks, Joanne! I’m glad you like it! Best chicken I have ever had. I burned my hand pretty badly on the pan making it. But it was OK since the meat was so tender, I only needed a fork to eat it. So glad you liked it, Sarah! Sorry to hear about your hand. I hope it heals soon! Thanks so much for your comment. This was delicious. Made marinade using half the sugar. Marinated both cauliflower and chicken thighs(separate dishes) and being lazy, skipped the frying and baked in the oven at 375 for 35 minute, 45 for the cauliflower. This is a keeper. Great ideas, Colleen! Thanks for sharing how you adapted the recipe. Love the idea of marinating the cauliflower too!